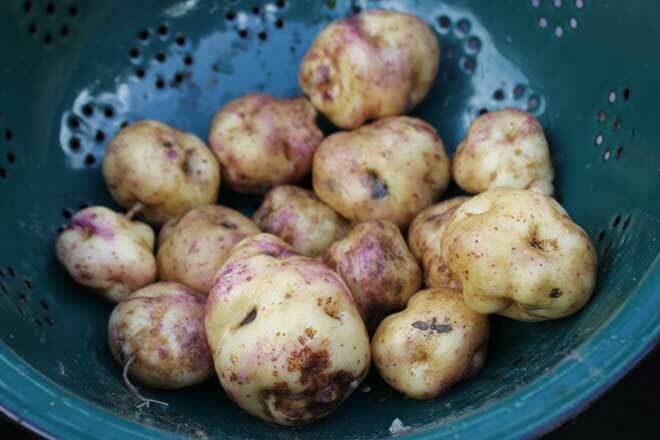 Poach the rua potato in salted water with their skins on until tender. Pour off the water and peel off the fine skin with a pairing knife, while the potato is still very hot! Hold the potato in a tea towel to stop it burning your hand! Then quickly pass the potato through a fine sieve. Spread the passed potato on you kitchen bench, and while the potato is still warm incorporate the salt, thyme, butter, olive oil, parmesan, egg yolk and saffron. Gently mix all together to form a smooth ball of dough. From here the gnocchi recipe can be shaped anyway you want, at The Grove restaurant we roll it thru a pasta machine and then fill it with the goats cheese mix to make little tortellini, which is very labor intensive, but beautiful! But for home its eaiser to shape into knuckle bone size. The gnocchi will now need to be poached in simmering salted water until it floats(about 3 minutes), then removed from the water and served with the crumbled goats cheese over the top. Peel asparagus with a fine peeler, cut into lenths. Blanch for 3 minutes in boiling salted water, then dress in sea salt, chopped chives, lemon oil and a grind of black pepper. Par Cook the eggs in boiling salted for 3 minutes, peel the shell and discard, the eggs will still be very soft inside, place in a bar blender. Blanch the parsley in boiling salted water for 4 minutes, drain well the press all the hot water out of the parsley using a tea towel. Place in the blender with the eggs and add the salt and pepper and the mustard. Blend.Whist blending, pour a slow stream of grape seed oil into the blender, essentially making a parsley mayonnaise. Shell 100g of salted pistachios and place in a small sauce pan, add 50g of butter, cook on a slow heat until the butter turns golden brown, this is your sauce! Salty Nut brown butter will give a sense of salty luxury and will bring the dish together.